SAHM Ramblings: Are You Done Yet? When I was in high school, my parents gave me the benefit of participating in Project Close Up. Aside from the government related things that I expected to learn, I attained one valuable piece of etiquette. As we prepared to eat one of the meals, I vaguely remember being told the proper way to indicate (for the servers) when we were done with our meal. When you are done eating, place your knife on your plate, then cross the tip of the fork over the top of the knife, with the tines facing down. More or less like I displayed in this picture... sometimes I end up with the handles a bit closer or off to the side. It all depends on whether there is food in the way, of course. After searching Google, I haven't been able to find any pictures online. 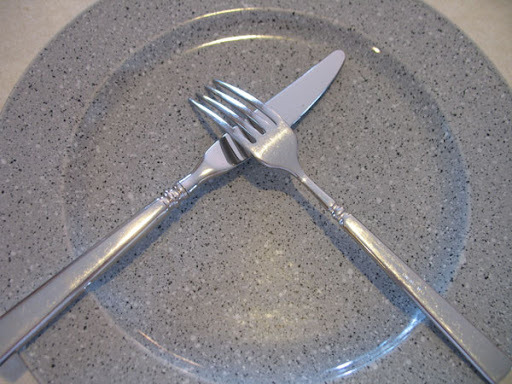 I read some posts that indicated to cross the utensils when done and one post that said you place both utensils side by side on the plate to indicate you're done. But no pictures. Crossing them is how I remember it and this is what I always do. More often than not the server will either just take my plate away without interrupting my conversation or will say "Let me get that out of your way." It's much nicer than hearing "Are you done with that?" or "Are you still working on that?" First, I'm curious if servers are taught to watch for utensil placement. I would also love to hear if I have remembered it correctly all these years later! And if I have... do they teach this any more? Too funny, great tip though! my husband says he believes that means it is bad food. Course I've always just piled everything up and placed them to the side of the table. I figure with four kids, two adults the table will look confusing and this would help them out. yes, I kind of do their job but why make it hard. ;) I think remembering table etiquette is a good thing, especially during the summer months when many will be out.